This final section looks to the future of managing archeological collections. What are the primary issues that will either continue to affect the activities and decisions of archeologists, repository staff, cultural resources managers, culturally affiliated groups, and others or will arise as significant? How will rapid technological changes affect collections care? Has enough progress been made that there is hope for continuing the fight against the curation crisis? 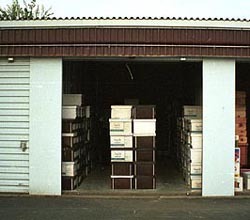 Some repositories have been forced to store growing collections in such inappropriate facilities as this self-storage unit. From the photograph collection of the U.S. Army Corps of Engineers, St. Louis District. Funding and Collections Growth: It has been and will continue to be difficult to find funding for the care of archeological collections. Funding for collections management at many repositories has been declining or staying steady in recent years. At the same time, collections continue to grow, especially from CRM work. The result is that a lot less money is available for a lot more material remains and associated records. Due to this disproportionate relationship, justifying and accounting for the management and care of collections is becoming an issue. Justification is especially significant when mismanagement in the past seriously affects archeological collections care now and in the future. Justifying long-term collections care involves recognizing and clearly stating the importance of collections as valuable, non-renewable resources for a variety of purposes. It also involves repositories, archeologists, and collections owners (e.g., federal, tribal, state, and local agencies) taking responsibility for their collections and being held accountable for their long-term care. The lack of funding and the need for proper care has led to more repositories charging fees for the care of collections (see Sections IV and V.) The lack of institutional funding also has meant that many repositories and archeologists have to explore alternative funding sources, particularly through granting agencies and private foundations. The former include the National Science Foundation, National Endowment for the Humanities, National Institute of Conservation, and the Institute of Museum and Library Services for both objects and records. The National Historic Preservation and Records Commission provides support for documentation only. Among the large number of private foundations across the U.S., those that may support collections care and management are the Boettcher Foundation (Colorado), the J.M. Kaplan Fund, the Edward John Noble Foundation, and the L.J. Skaggs and Mary Skaggs Foundation. Unfortunately, these funding sources usually are not available for the care and management of federal collections. The juxtaposition of funding needs and collections growth will not go away soon. Fortunately, some state, tribal, and federal agencies have completed or are building their own repositories to the standards of 36 CFR 79. These actions relieve some of the burden of collections care on the non-federal repositories that have managed federal and state collections for years. Furthermore, with greater public understanding of the educational, research, interpretive, and heritage values of archeological collections, other funding opportunities might develop. Box collapsing from dampness, damaging the artifacts inside. Photo courtesy of Alexandria Archaeology, City of Alexandria, Virginia. Rehabilitation of Existing Collections: Over the last decade, NAGPRA and 36 CFR 79 have forced attention on the inventory of collections across the U.S.--exactly what do repositories hold? Both the inventory process and new requirements for accountability of federal- and state-owned resources have helped reveal the poor condition of many collections. In turn, archeologists are increasingly realizing that there are treasures of information to be had in deteriorating collections. It is likely, therefore, that a significant future issue will be the need to assess the condition of existing collections and rehabilitate many of them. This will involve significant funding, which must be justified based on the educational, research, and heritage values of the collections. 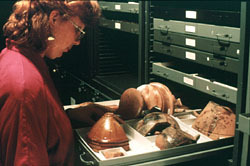 The U.S. Army Corps of Engineers' Mandatory Center of Expertise for the Curation and Management of Archeological Collections (MCX-CMAC) has taken the lead in this activity by conducting numerous collections-needs assessments and several rehabilitation projects for the Department of Defense. Certification of repositories managing archeological collections: Current laws and regulations identify responsibility for the long-term care and management of collections resulting from archeological activities on federal and tribal lands and, in many cases, state and local lands. Repositories that hold these collections are also required to meet specific standards for collections care. Unfortunately, the laws and regulations do not provide a way for owners of new collections to determine if a repository meets those standards. Nor is there a means to enforce those standards. Federal government agencies and CRM companies are increasingly interested in having a way to determine if a repository meets the standards in 36 CFR 79. The Curation Options Project recently completed by the MCX-CMAC of the Army Corps of Engineers assessed many repositories across the U.S. to determine their degree of compliance with 36 CFR 79. The results of their study is currently available (see Links page) and provides one possible guide for new collection owners. A system similar to or appended to the accreditation program of the American Association of Museums (AAM) is another possible mechanism to alleviate the problem of insufficient information about repository capabilities. The biggest hurdle to aligning such a program with that of the AAM is the latter's emphasis on public outreach and education. This is because public programming is not in the mission statement of all repositories that manage archeological collections. Notably, the Council of Texas Archaeologists (CTA) Accreditation and Review Council (ARC) has recently developed a system to accredit repositories in the state of Texas that hold archeological collections and meet standards set forth by the Council. Its successes and difficulties will be closely watched by many professionals across the U.S. over the next few years and may provide a model to address this issue at a national level. Deaccessioning: The rapid expansion of archeological collections is forcing serious consideration of the need to be able to deaccession particular parts of collections, especially bulky and redundant material remains. There are currently no federal standards or guidelines regarding deaccessioning of archeological collections. Some states, such as Texas, are in the process of creating policies and standards for this activity. Many private museums, academic repositories, and historical societies have deaccessioning policies that they use with care. Provisions for deaccessioning federal collections were never finalized in 36 CFR 79 because of disagreements over the issue. Although this regulation has not been revised and promulgated to date, there is some movement to develop profession-wide standards in the near future. These standards must be the result of a collaborative effort between all interested parties, including professional archeological societies, repositories, agencies, and interested culture groups. With deaccessioning standards in place, it will be easier to justify long-term care for existing and new collections as wholly valid and valuable resources. Changes in Research Methodology: The fields of archeology and museology are dynamic professions. Changes in recent decades have been significant, both in the field and the repository, and more are sure to develop. The increased use of scientific analysis on archeological objects is an important change in the profession that will continue to be influential. The increasing numbers of new analytical techniques, such as DNA testing, means that new types of information are yielded, new types of material remains are being analyzed, and some common artifact types must now be cleaned and handled differently. An example of the latter involves caring for and handling potsherds with encrusted materials that can now be studied by residue analysis. These changes in research techniques have affected and will continue to affect how archeological collections are valued and managed, including decisions on what is collected in the field, what is kept in the lab and repository, how it is processed, and how it is accessed and used. Archeological collections, both the material remains and associated records, are an investment for the future and must be periodically assessed in regards to changes and opportunities in professional practice. 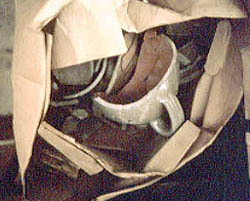 Ceramic storage at Colonial National Historical Park. Photo courtesy of Museum Management Program, National Park Service. Improvements in and increasing attention to archeological collections management holds considerable promise for the proper and long-term care of our archeological heritage. Significant strides have been made in the last decade, but more are needed still. Good management of archeological collections is essential to maintain their value for scholarship, interpretation, and heritage. You learned here how these resources need to be managed and preserved in order to make them accessible for use. Also, you learned about your responsibilities to these resources, as well as how you can access and use them. The proper management of archeological collections necessitates cooperative and collaborative relationships between a wide variety of interested parties that should be commonplace and part of everyday work. Good relationships between repository staff (e.g., curators, conservators, collections managers, and archivists) and the principal investigator of an archeological project before, during, and after a project are critical to the long-term care of and access to the resulting collection. It is also important that project staff and repository staff have good relationships with the culture groups whose heritage is tied to archeological remains. This helps ensure that the collections are managed to the benefit of all interested groups. Cooperation and collaboration also has to occur between the government agencies that own a large portion of the archeological resources in the U.S. and the repositories that curate them. Efforts need to be made to ensure that compliance with 36 CFR 79 and related state or local laws benefits the collections, repositories, and agencies. Both collections management and archeology will continue to change. 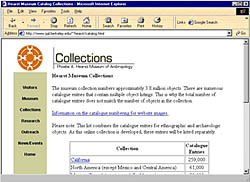 The opportunities provided by computerized technologies will continue to grow and provide opportunities for viable collections management tools. New scientific methods, techniques, and theoretical paradigms will continue to influence the way archeology and collections management is done. A significant challenge for the future is to keep educating a wide variety of groups about the value of archeological collections, including their associated records, and the need for their long-term preservation. Once damaged or lost, these non-renewable resources are never again available for research, interpretation, or heritage uses. Without this invaluable legacy, why was the archeological work done in the first place? 1994 An Archaeological Curation-Needs Assessment for the U.S. Army Corps of Engineers, Mobile District. Technical Report No. 3. St. Louis: U.S. Army Corps of Engineers, Technical Center of Expertise in Archaeological Curation and Collections Management. 1992 "Computerized Information Exchanges on the Local and National Levels in USA." In Sites & Monuments. National Archaeological Records, C. Larsen, ed., pp. 23-47. Copenhagen: National Museum of Denmark. 1999 "Contemplating the Future: Deaccessioning Federal Archaeological Collections." Museum Anthropology 23(2):38-45. 2004 "A Survey of SHPO Archeological Report Bibliographic Systems, 2002." Studies in Archeology and Ethnography 5. Washington, DC: Archeology Program, National Park Service. 1999 Archaeology in the Age of the Internet: Conference on Computer Applications and Quantitative Methods in Archaeology: Proceedings of the 25th Anniversary Conference. BAR International Series, v.750. Oxford: Archaeopress. 2004 "Archiving Digital Archaeological Records." In Our Collective Responsibility: The Ethics and Practice of Archaeological Collections Stewardship, S. T. Childs, ed., pp. 67-73. Washington, DC: Society for American Archaeology. 1998 "Archiving Archeological Data in the Next Millennium." CRM 21(6): 21-23. 1998 "CRM and the WWW." CRM 21(5):18-19. 1999 "Accountability in the Management of Federally Associated Archeological Collections." Museum Anthropology 23(2):19-33. 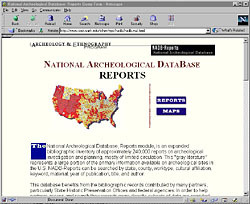 1997 Dig That Site: Exploring Archaeology, History, and Civilization on the Internet. Englewood, CO: Libraries Unlimited. 1994 "Archeological and Natural Resource Collections of the National Park Service: Opportunities and Threats." Curator 37(2):122-128. 1997 "The Future of the Past: Archaeology and Anthropology on the World Wide Web." Archives and Museum Informatics 11(2):87-105. 1998 "The Online Lab Manual: Reference Collections on the Web." Society for American Archaeology Bulletin 16(5):17-19, 39.
n.d. GIS and Archeology: A Demonstration. Crownsville, MD: Maryland Historical Trust. CD-ROM. 1993 Archaeological Curation-Needs Assessment for Fort Sill, Oklahoma, Fort Gordon, Georgia, Vandenberg Air Force Base, California, Camp Pendleton Marine Corps Base, California, and Naval Air Weapons Station, China Lake, California. Technical Report No. 1. St. Louis: U.S. Army Corps of Engineers, Technical Center of Expertise in Archaeological Curation and Collections Management. 1988 Directory of Archives and Manuscript Repositories in the United States, 2nd. Phoenix, AZ and New York: National Historical Publications and Oryx Press. 2004 "Adaptive Reuse: Incorporating Public Education into the Curation Process." In Our Collective Responsibility: The Ethics and Practice of Archaeological Collections Stewardship, S.T. Childs, ed, pp. 137-145. Washington, DC: Society for American Archaeology. 1999 "Creating Permanent and Durable Information: Physical Media and Storage Information." CRM 22(2):25-27. 2003 "Deaccessioning: The Archeologist's Conundrum." The SAA Archaeological Record 3(4):8-9. 1996 "Primal Fear: Deaccessioning Collections." Common Ground 1(2):27-29. 1998 Excavating Occaneechi Town. Chapel Hill, NC: University of North Carolina Press. CD-ROM. 2003 "The Curation Dilemma: A Mutual Problem for Research and Resource Management." In Protecting the Archaeological Heritage of America. Robert Drennan and Santiago Mora, eds. Washington, D.C.: Society for American Archaeology. 1989 "Future Directions: Management of the Archaeological Data Base." In Quandaries and Quests: Visions of Archaeology's Future. LuAnn Wandsnider, ed., pp. 147-159. Carbondale: Center for Archaeological Investigations, Occasional Paper No. 20, Southern Illinois University. 1994 "Museums and the Internet: A Guide for the Intrepid Traveler." Museum News 73(4):32.